The National Aeronautics and Space Administration is currently developing a pair of humongous legs for its robotic astronaut. NASA is apparently attempting to speed up the timetable on humanity's eventual eradication. Today, the agency showed off a pair of newly fabricated legs for the Robonaut 2, a humanoid robot produced by the Dextrous Robotics Laboratory at NASA's Johnson Space Center in Texas. 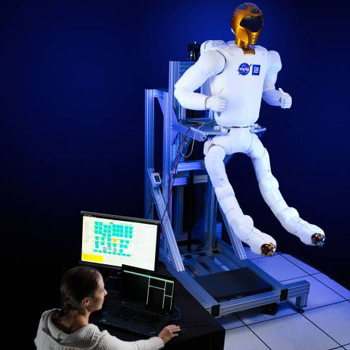 The legs are primarily designed to increase Robonaut 2's maneuverability in zero gravity, which will allow the humanoid crew to concentrate on more high-priority projects. Once attached, the Robonaut 2 will have a leg span of nine feet. Each appendage has seven joints, which means that the robotic astronaut's legs have more in common with a monstrous spider than a normal human being. A device on the end of each leg will allow the robot to negotiate the station using handrails and specialized sockets. The Robonaut 2 has been a crew member on the International Space Station since 2011, and NASA expects its shiny, new legs to be ready for delivery next year.